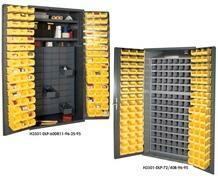 96 Hook-On Bins included with 36" model. Cabinets are heavy duty 14 gauge construction and feature 2 adjustable shelves and louvered panels on doors for use with bins included. Doors have fully welded piano hinges and can hold up to 650 lbs. (weight evenly distributed). 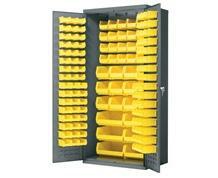 96 Hook-on Bins are also included. H3501-DLP-60DR11-96-2S-95comes with 60 Jumbo, 3-1/2" H drawers, each with 2 dividers adjustable on 1" centers (extra dividers are available). H3501-DLP-72/40B-96-95 has 12" deep, 112 pigeon hole bins enclosed - perfect for storage of fasteners, high value small parts and more. Available in Gray powder coat finish. Ships fully assembled. FOB Shipping Point. 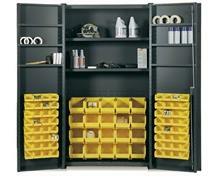 For use with All-Welded Storage Cabinets. 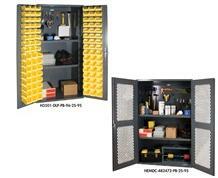 Bins fit All-Welded Storage Cabinets. 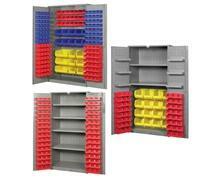 Removable bins increase storage density, speed selection and retrieval. FOB Shipping Point. 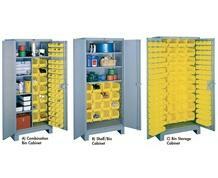 Removable bins increase storage density, speed selection and retrieval. 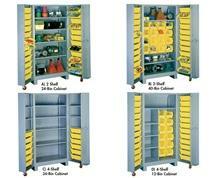 Bins available in Yellow, Blue or Red -- please specify at checkout.